The ominous name of the Dionaea muscipula ‘Green voodoo’ shows how this Venus fly-trap species bedazzles insects with its alluring bright-green colour and its aerodynamic traps. These traps look almost too perfect, whereby one nearly forgets how deadly they can be for insects making for the colour and smell of the Dionaea muscipula ‘Green voodoo’. Its colour will stay green, although some red discolouration is possible if exposed to plenty of direct sunlight. 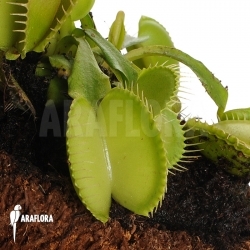 Try to provide a permanently moist soil during the growth period of this Venus fly-trap, but reduce watering during the rest period: but above all take care that the soil stays moist.